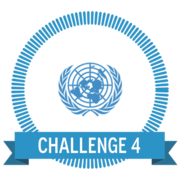 Your fourth challenge is to select and embed a video suited to your UN Development Goal in a blog post. Step One: Go to the Sustainable Development Goals video page and select your goal. Step Three: Create a blog post called Video Blog Post. Step Four: Drag the Youtube widget onto your page. When you click on the widget it will ask you for a Youtube URL. Copy the URL into the widget and it will embed the video. Check this link if you need more information. Step Five: In your blog post, write down five things that you have learned about your issue form watching your video.